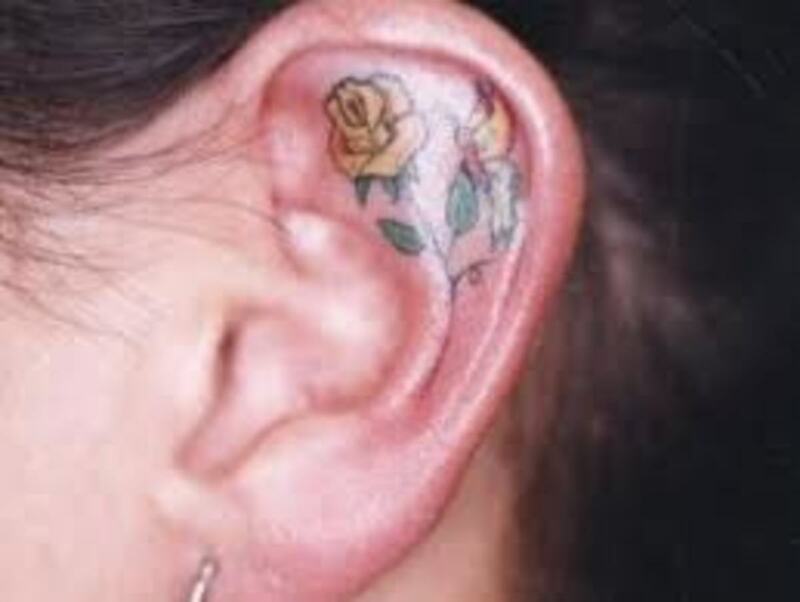 Ear tattoos are becoming a very popular choice for those seeking to get inked. What is particularly interesting is approximately 95% of all those choosing to get an ear tattoo are women (my observation). I think that's because they can easily hide the tattoo if they want to with their hair, while at the same time being able to display it in the appropriate social situations. That's not to say men don't have ear tattoos, but most men like to have their tattoos out their in your face, rather than be more discreet with their tattoos. 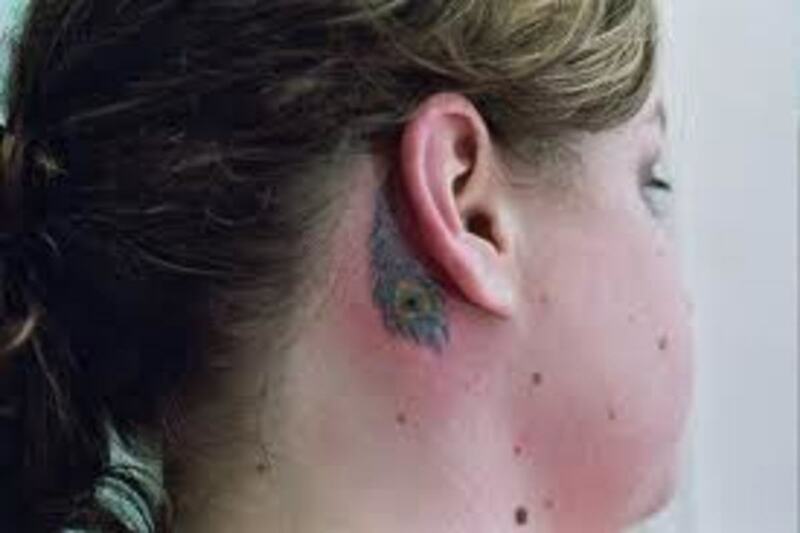 It appears that those deciding to have a tattoo around and/or behind the ear are those that want to have more control over their body art, offering more flexibility than those having a tattoo on parts of their body that are difficult to cover under required circumstances. I'm thinking mostly of some types of jobs or circumstances where it could be personally detrimental to have visible tattoos. Among the most popular tattoo designs chosen for around, behind or in the ear are stars, flying creatures like birds, bees or dragonflies, flowers, and some type of musical notes. Even so, there are thousands of other unique designs people have chosen; some of them one-of-a-kind and very compelling, interesting and fun to look at. We'll now look at a gallery of ear tattoo designs to generate some ideas, or just enjoy the creativity and work of the tattoo artists. With this first tattoo in the gallery, we have a great image of lighting coming down out of a cloud with rain falling on the sides of the lightning. 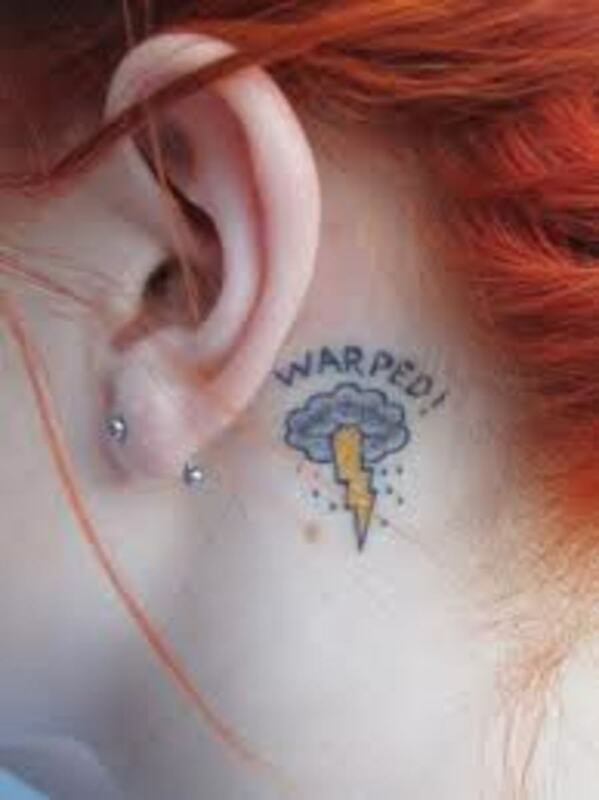 While I'm not sure what the word "warped" means, it is the type of tattoo that would generate questions. 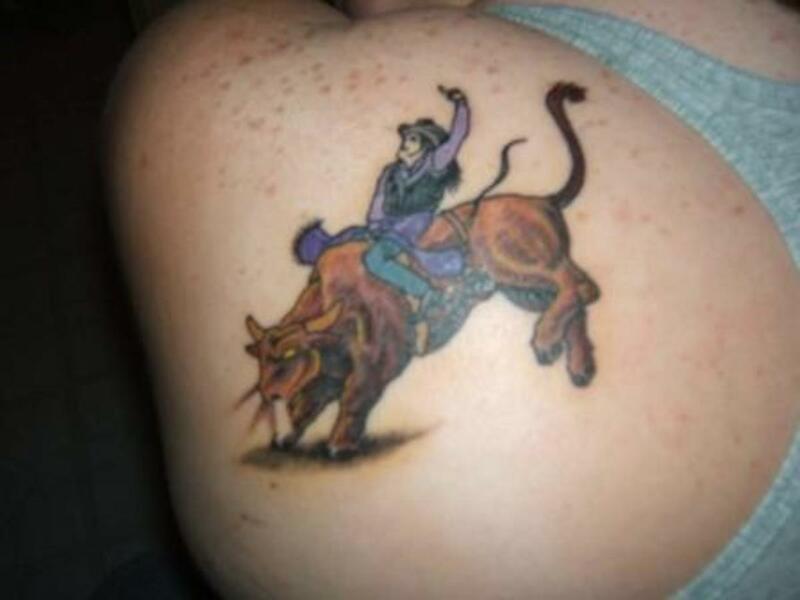 And in that regard it is a success, as part of the reason for a tattoo is to result in it striking up a conversation. 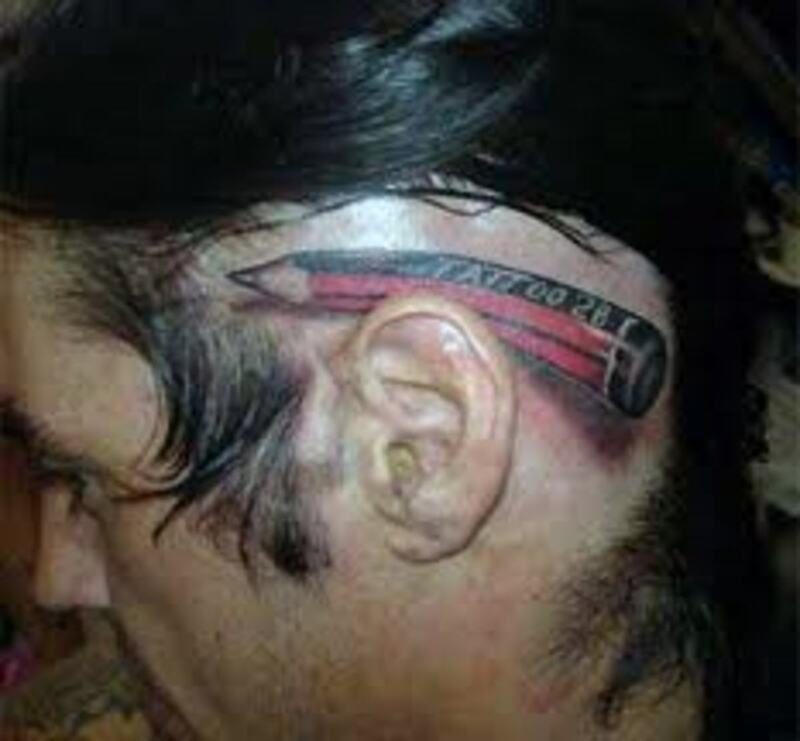 This tattoo of a pencil lying on the ear is hilarious. I wonder how many second looks this guy gets when he displays the tattoo, which of course can be easily hidden where it is located. 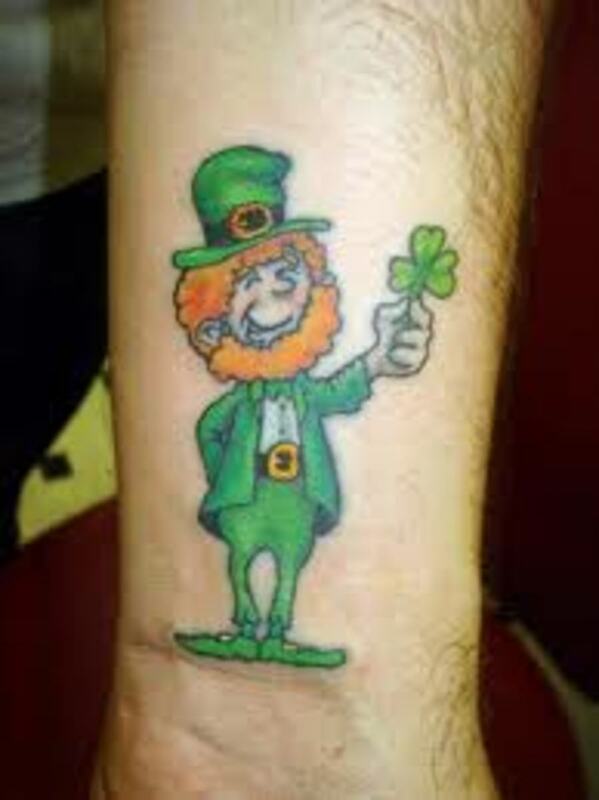 Pretty good tattoo design for what it is. 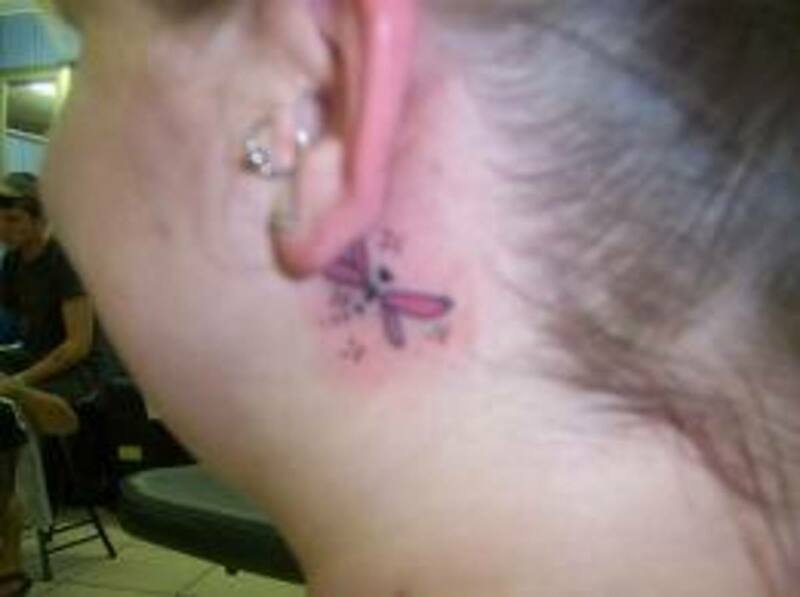 Dragonfly tattoos are great to look at, and work nicely around the ear, as you can see below. Everything must be kept miniature when designing tattoos for placement behind the ear, and the design her, in my opinion, is perfect for the subject matter. I like the decision to have the body of the dragonfly disjointed and moving from larger to smaller black circles as you go down the body. 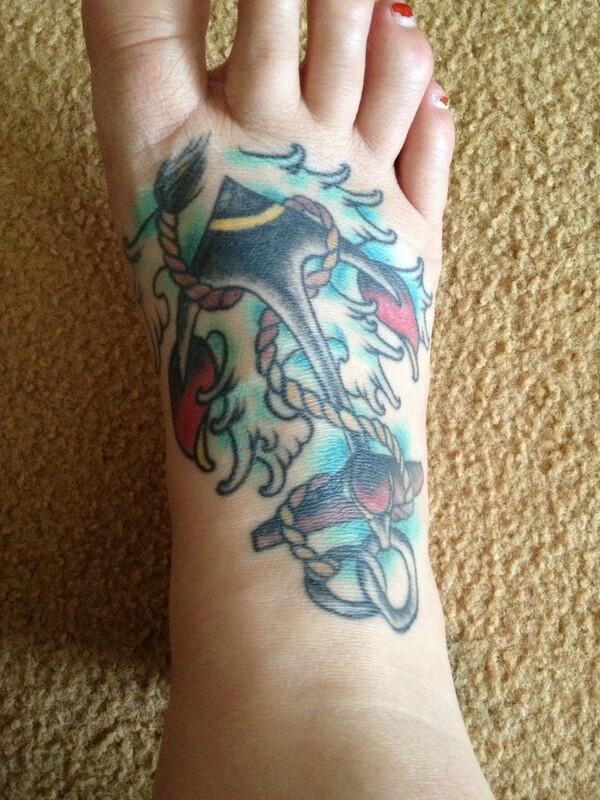 Nice tattoo. The beautiful colors of the peacock make for nice subject matter for a tattoo, and it wouldn't be easy to capture that color in the small area you see in the tattoo below. But not only is the color captured well, but the shape of the peacock feather is retained in the process. I like the decision to have the shape of the feather coincide with the curvature of the year, allowing the tattoo to be fully seen while allowing it to be covered if it needs to be. The next three tattoo designs will be of the more popular ones in regard to the ear. 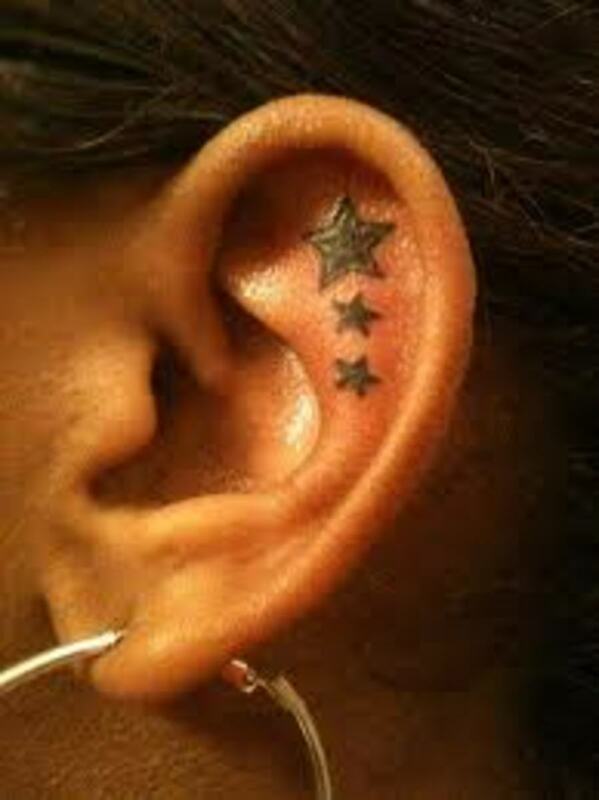 First we'll look at three star tattoos, which are placed either behind the ear or in the ear. 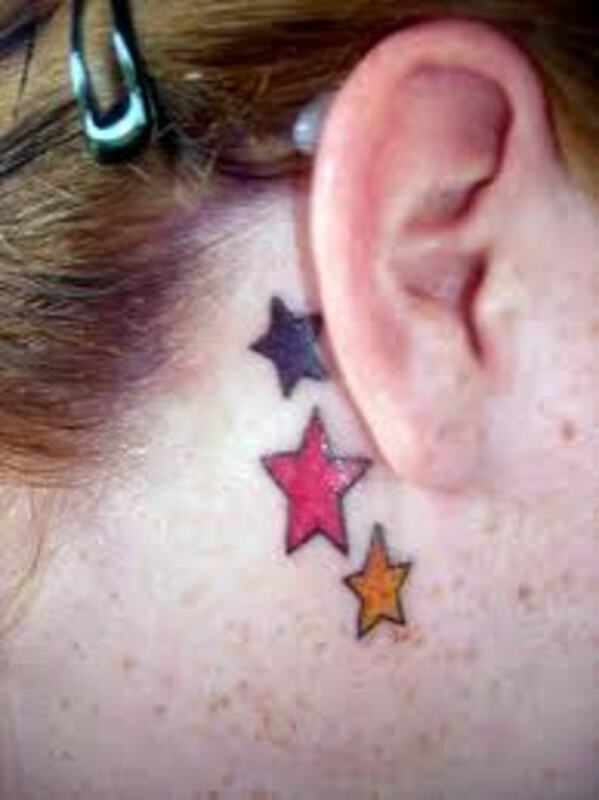 These are all very different, as there is one that includes stars with different colors, as shown in the first tattoo; dark stars of different sizes in the second tattoo; and dark stars inside the ear. 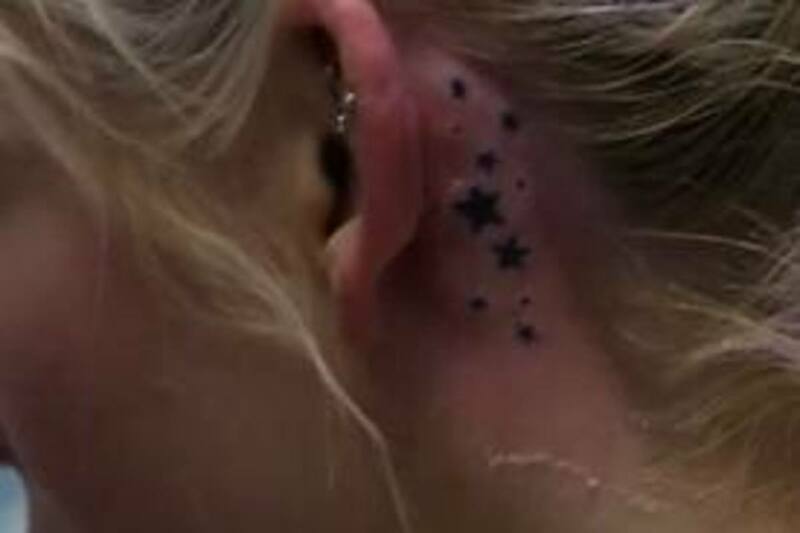 My favorite of the three is the star tattoo with a variety of sizes behind the ear. I like the way the stars were made in different sizes and the overall look of the tattoo. The stars inside the ear look nice too, especially the larger one, which if you look closely, you'll see has a little space between the outer and inner part of the star; a very difficult design for that tiny space the artist had to work with. As for the stars with color, they're a little too cartoonish looking for my tastes, but I'm sure they work good for those who like color rather than the darker ink. . 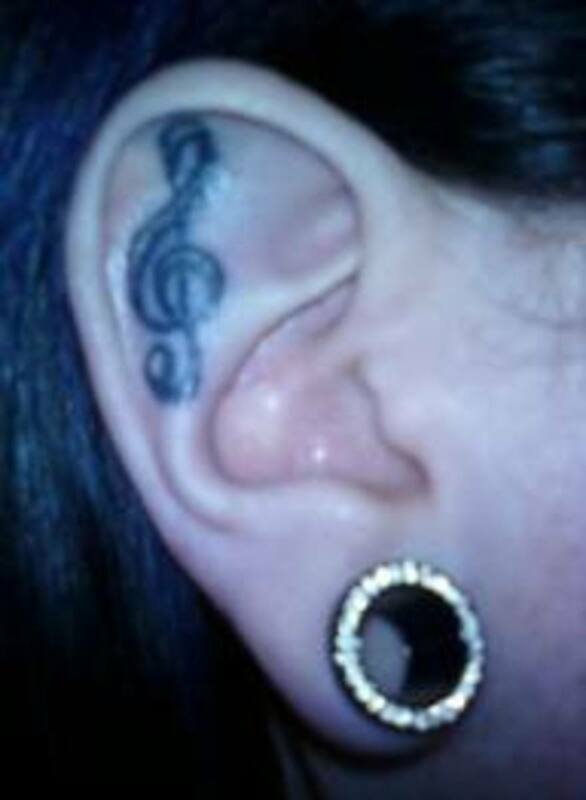 Here we have another very popular tattoo design for the ear: the musical note tattoo. Musical notes are also popular for many parts of the body people choose to have inked. While there are a lot of types of musical notes that are chosen as the preferred tattoo design, in my experience it seems the treble clef is the most used, as most people at least know what it is and what it represents. 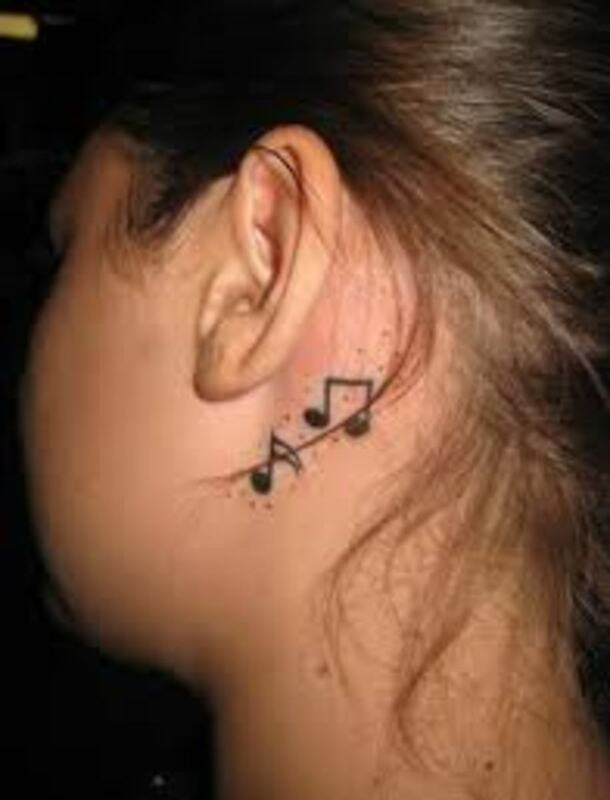 Even so, there are a lot of other musical notes that are desirable to those making tattoo design decisions, with some even having parts of an entire song tattooed on them, although that obviously doesn't work for the ear. 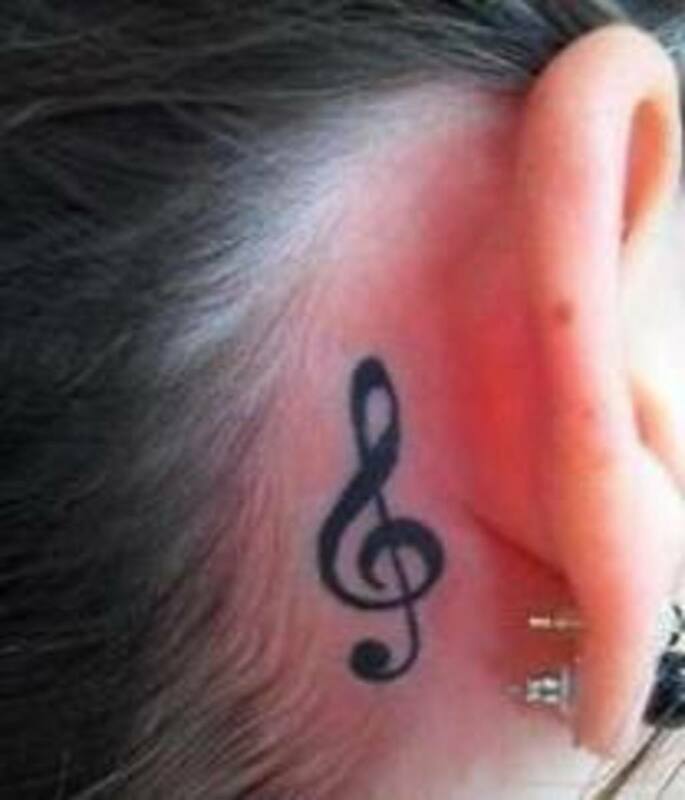 For me, I think I would choose something that isn't a treble clef if I decided to have a musical note tattoo, as I think they look a lot cooler, and you can include a variety of notes that look good. Having said that, my favorite below is the top one. Not only do I like the look of the notes, but those little scattered dots add to the overall look and feel of the design. 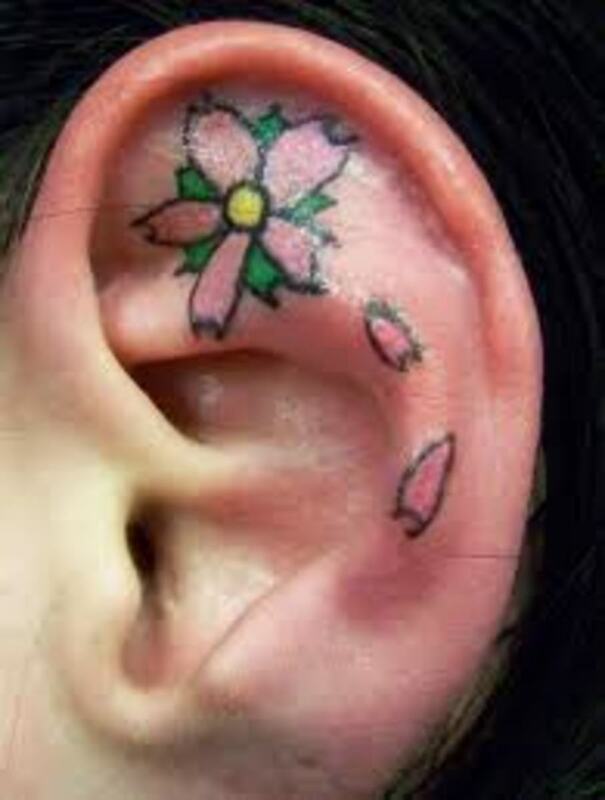 Of all the ear tattoo designs shown in this tattoo gallery, or that I've seen on other people in different places, the flower tattoo is my favorite. I think the reason for that is there are simply so many flowers you can choose from, and so many things you can do with the very flexible flower, as you can see in the examples below. Everyone of the flower tattoos look fantastic to me, and it's hard to pick my personal favorite from the group. The rose tattoo is very well done, and including that subtle yellow rose and green foliage makes it a great design. 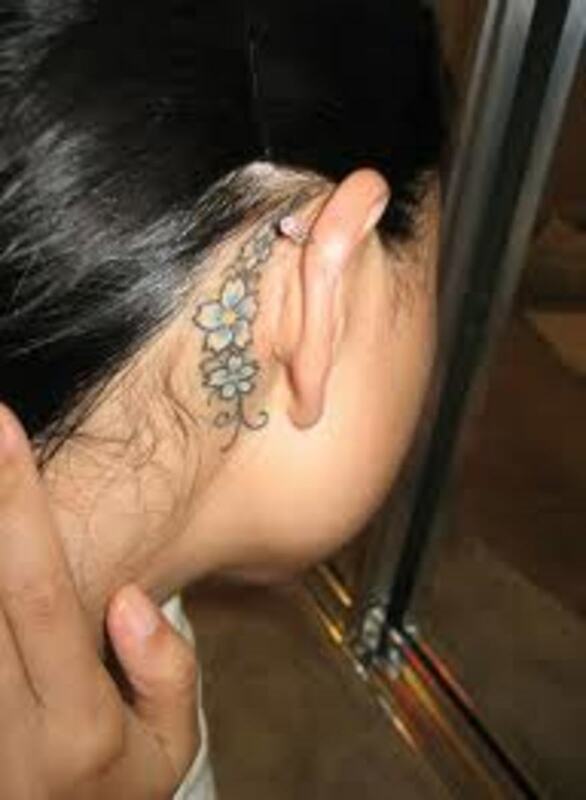 If you like scrolling and a group of flowers following the conture of the ear, the bottom tattoo design is a great choice. The flowers look fantastic, and the decision to have smaller flowers on either side with the large one more in the center really works nicely. Because I love that falling petal or flower look, my choice as favorite of these three flower tattoos would have to be the middle one, even though I like the color of the rose tattoo better. The pink flower with the green foliage background looks good, but it's the broken, falling pink petals from the flower that wins me over. It's similar to feather tattoos that have parts falling from them, which are among my favorite. I can't explain why that's the case, but they are very attractive and compelling to me. In this gallery of ear tattoo designs, it shows the reasoning behind why a particular choice is made. What's interesting to me is the way a particular design choice can work either in the ear, behind the ear, or around the ear. It doesn't seem to be the key factor in how it looks, but rather what is done with the subject matter which makes the biggest difference on the extent of its success. Ear tattoos are a very good choice for those wanting to be able to show them off in social situations which will result in initiating conversations, while at the same time being able to cover them up if you don't always want to be displaying your ink. In that regard tattoos in or around the ear are among the better choices. Another good choice with those parameters are tattoos close to the back of the hairline on your neck. 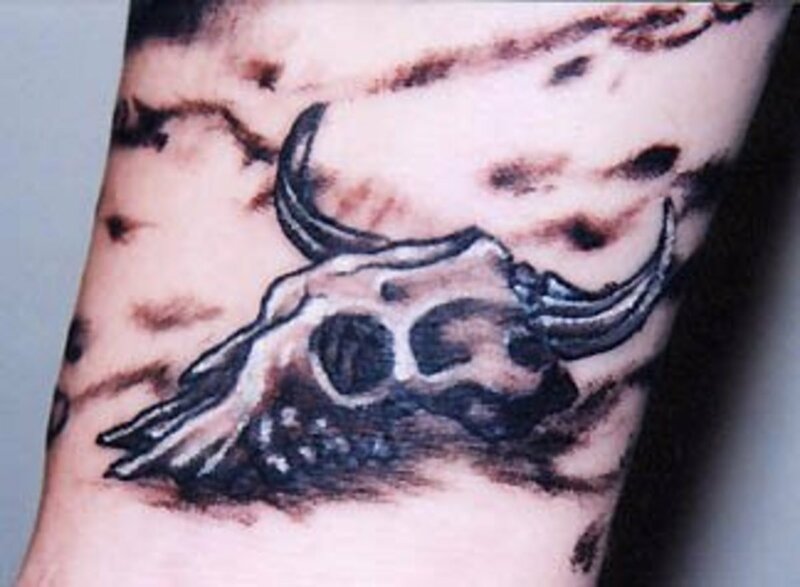 Either way, there are a lot of designs out there to offer someone wanting to get some ear ink, which look great and meet the requirements and reasons for choosing them. 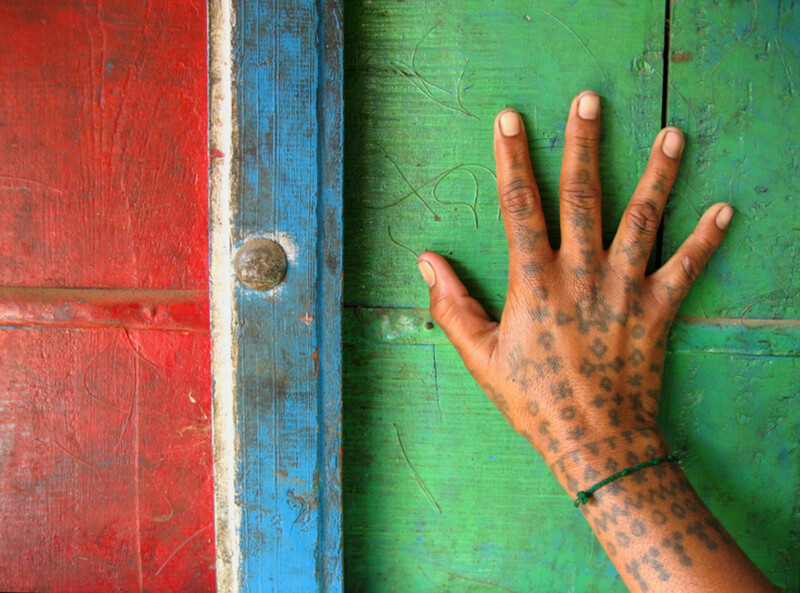 Wow, as someone who has a lot of tattoos, I still found this article enlightening. I had never considered getting one behind my ear, but after seeing some of the photos here, I realize you can get some lovely and descrete designs done. Good pictures!